March Is the Month to . . .
Plan to Keep It Covered! Prune fruit trees, while the trees are still dormant. For more information, see Growing Fruit Trees in Maine: Pruning. Build additional raised bed gardens for 2014. Rough sawn hemlock (2” X 10”) can be purchased at a local lumberyard. A bed measuring 4 feet wide and 10 feet long will cost approximately $25 in material and fasteners. To fill such a bed you will need about 1.25 cubic yard of top soil/compost, which costs about $25. Plan your vegetable garden for 2014. Sketch your plan on paper or use free garden-planning tools online. Create a list of seeds (types and amounts) and transplant needs. Research season extension techniques that are appropriate for your situation. Compile a “to do” list for season extension for 2014. 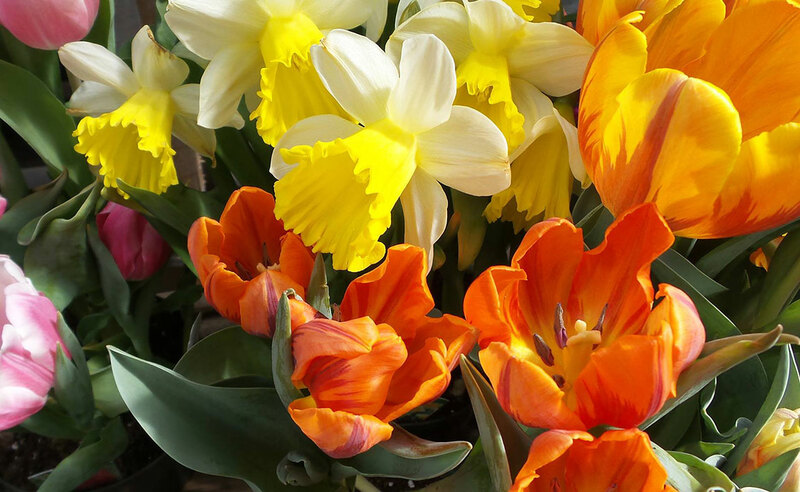 Visit your favorite year-round garden center to see and learn about new products. It’s a great time to pick up seed. Start thinking about and identifying possible sources of organic matter for your garden soil. Organic matter in the soil improves water holding capacity, nutrient holding capacity, and over-all soil health. Consider using cover crops this year to promote soil conservation and soil health. Review the USDA’s cover crop chart for some possible ideas. 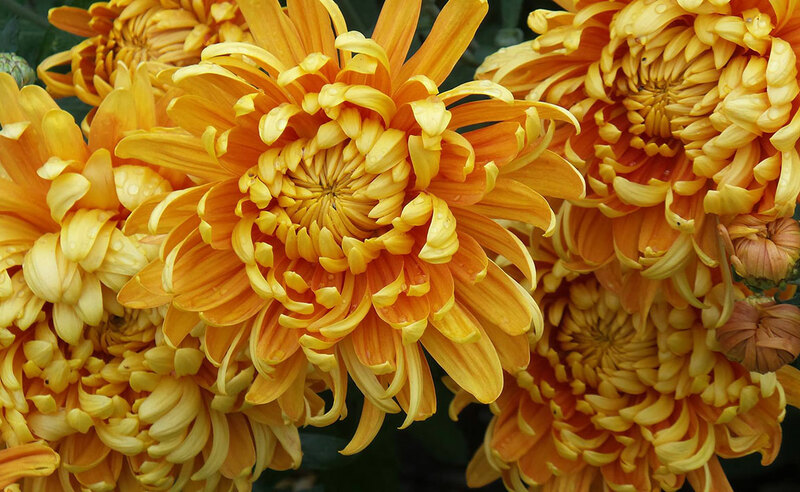 Attend a flower show in your area. These shows are great place to learn, interact with others, gather information, and see new products. Inspect trees on your property and repair trees that are damaged. The winter can be hard on plant life. Hire professionals to perform the repairs if needed. They are experienced and equipped to address dangerous situations. For more information, see Bulletin #2169, Pruning Woody Landscape Plants. Start seeds around mid March. For more information, see Bulletin #2751, Starting Seeds at Home. Repot houseplants that are showing signs of restricted root growth. 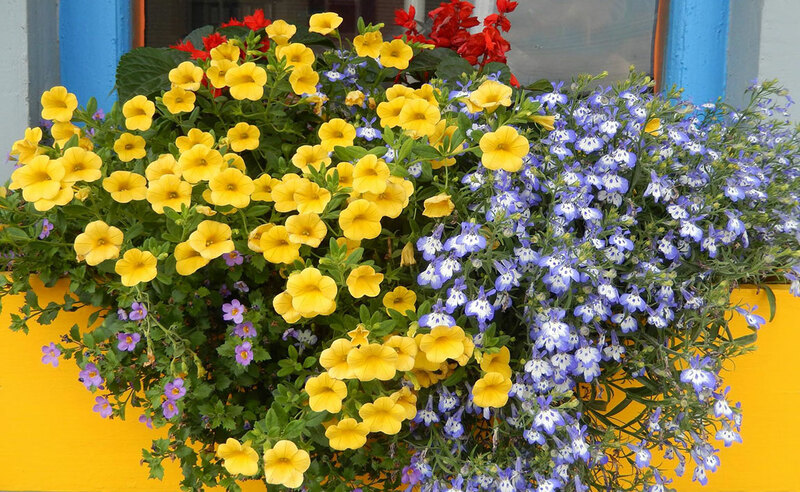 Take cuttings of houseplants such as geraniums and impatiens for your summer garden. Do you realize how much goodness comes from your garden? Fresh fruits and vegetables are great for your health! Make it a point this growing season to learn about good nutrition and the roles that fruits and vegetables play in your diet. Download our Vegetables and Fruits for Health fact sheets for free! Support the Maine Master Gardener Volunteers Program by purchasing sets of one or more of the following: blueberry plants, asparagus crowns or strawberry plants. With your purchase, you are provided with “how to” videos and supporting information for a successful gardening experience. For more information see “Grow It Right!” Benefit Plant Sale. As March and April roll around, gardeners begin to anticipate the first new garden crops of the year. Peas are a favorite of many gardeners and many have a favorite variety. But, what does a new gardener do when he or she opens a seed catalog and tries to decide between field peas, sugar snap peas, snow peas and shell peas? Field peas (Pisum sativum) have been cultivated for thousands of years and are also known as dry peas, white peas or soup peas. They are harvested when they are mature and dry. Sometimes they are used as livestock feed. They have a vining habit like other peas and are grown similarly. Sugar or snap peas (Pisum sativum var. macrocarpon) are edible-podded peas with round pods. They resemble shell peas but have pods that are less fibrous and tough, making both the peas and the pods tender and edible. Snap peas are usually a good variety to grow if you want to harvest pea shoots or tendrils for early spring stir fries or salads. Plant some extra peas to harvest for pea shoots. Snow peas (Pisum sativum var. saccharatum) are edible-podded peas with flat pods that are picked and eaten before the pods begin to fill out. Both snap peas and snow peas are known as “mange-tout” which is French for “eat all”. Shell peas have tough inedible pods that are harvested and eaten when the peas inside the pod fill out and mature. The pods are not eaten. Shell peas have short, medium and long season varieties and planting some of each or planting one variety every two weeks throughout the spring can help extend your pea harvest season. All peas are cool season crops and are best planted in Maine in the early spring (as soon as the ground is workable) for a spring and early summer harvest. They can also be planted in the midsummer for a fall harvest. Peas tolerate cold temperatures but should be planted when the soil temperature reaches 450 Fahrenheit in the spring. This usually happens in early, mid or late April in Maine. Peas grow best in a well-drained soil and set the most fruit in a full sun location. As members of the legume family they can fix nitrogen in root nodules that are formed with rhizobium bacteria. You may want to buy a rhizobium inoculant for peas to dust your seeds at planting time. This will ensure that the bacteria will be available to your crop. When the peas and rhizobium fix nitrogen, it will be available for the next vegetable that you plant after you the pea season ends if you cut the peas down at the soil level and leave the roots in the ground. Some newer varieties of peas are short-vined bush varieties and are advertised as needing no staking but most peas benefit from some kind of trellis or support system. A trellis system of sticks, bamboo or lumber and chicken wire will support the peas, reduce fungal diseases and make the peas easier to keep picked. Regular picking helps extend the harvest season by keeping the plant blossoming and developing new peas. Peas mature from the bottom of the plant up and should be harvested when the pods are shiny. When the pods turn a dull color, they are mature and can rapidly become overripe and starchy rather than sweet. Peas have few pest and disease problems but can be bothered by fungal diseases in cold, wet weather. Choose resistant varieties to avoid disease problems. Weevils, aphids and thrips can also bother peas. Scout carefully and control these pests before they become a problem. Planting peas is usually a fast start to the new gardening season. Nothing tastes as good as the first peas of spring. They are tasty plain and used in many delicious recipes. If you are looking for a good stir-fry recipe, you can find one on our factsheet: Bulletin #4256, Vegetables and Fruits for Health: Peas. Soil quality is a great discussion topic as we wait for the snow to melt and our gardens to reappear from their winter cover of white. 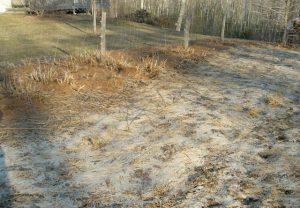 While snow covering is not what this article is about, protecting soil from rain, wind, and erosion is critical to a healthy garden. This is especially true as we seem to have increasingly severe weather events and stronger, heavier rainfall periods. When water from rainfall events runs off the garden instead of infiltrating, you lose valuable nutrients and soil organic matter. We also run the risk of polluting nearby-water sources. So what steps can you plan for your garden to keep your soil protected? 1) If you had a cover crop (winter rye for example), consider trampling it down in areas where you will not be planting, such as walkways in the garden. If you trample it down after it heads out, it will senesce and die, leaving a nice mulch to cover the soil and provide some good weed control. Dead oat cover crop and pine needle much in the spring. 2) If you used an oat cover crop last fall, it will be a dead mat of material in your garden. Instead of tilling it up, think about what early crops you may be able to seed into the mulch or transplant into the residue instead of tilling it in. 3) Grow some more cover! If the snow melts and you have areas that will not be planted until late May or early June, consider growing an early spring cover crop. Oats are a great option. I buy “whole feed oats” from a livestock feed dealer as they are more reasonably priced compared to “seed” oats. The early growth that the oats put on will protect the soil, provide some nice “green” manure when you till it in, and also potentially give you some weed seed inhibition or “allelopathy” when you do plant your main crop. 4) Consider using more mulches around your plants. We usually consider mulching a “weed control” strategy, but I tend to look at it as a soil protector, providing some great sheltered habitat for beneficial soil microorganisms that will thrive right at the soil/mulch interface. The mulch protects against damaging rains, and also buffers the soil from extreme temperature swings — also a benefit to the soil microorganisms. Of course, everything is not perfect, and you need to be on the lookout for pests such as slugs that enjoy the mulches as well! 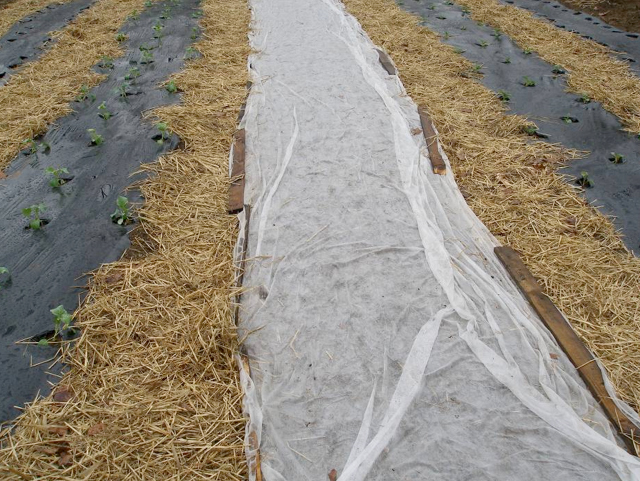 5) Even though it is not very visually attractive, and doesn’t add organic matter, think about the use of plastic mulches for some of your crops. These mulches are normally thought of as weed control techniques as are organic mulches, but they do help to protect your soil resources as well. This is especially true if you add organic mulches between the rows of plastic. I always try to demonstrate how mulches can protect and enhance soil quality by asking gardeners to keep a very small part of their garden heavily mulched with some hay or straw. 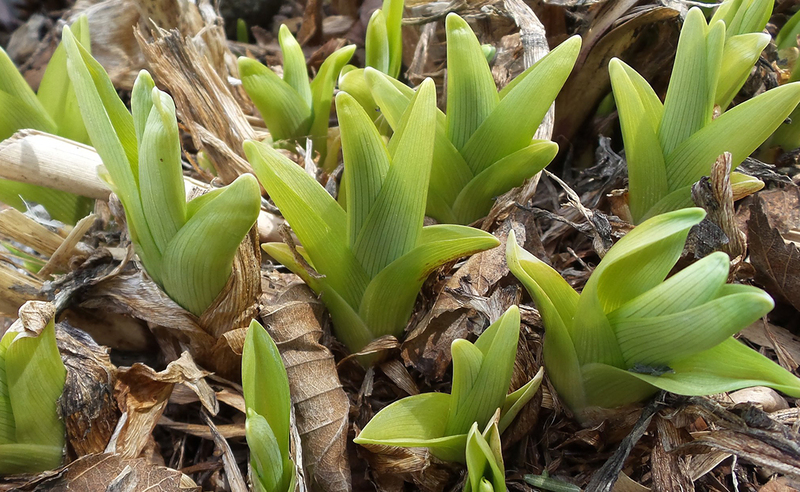 Near the end of the garden season, lift the mulch and examine the soil carefully. You will find some beautiful “drakes crumb cake” soil structure and lots of evidence of earthworm activity — signs of a biologically healthy soil. Although the garden season is still just a thought in our minds, and we have a few more weeks to really get excited, now is the time to plan how you will add winter cover crops into the garden in the fall. Having seed ready and a plan to sow some cover crops as soon as you get some harvested bare space in the garden will facilitate and increase the probability that you will be conserving the ever-improving soil in your garden. Skowhegan History House, located on historic Elm Street in Skowhegan, is housed in an 1839 restored brick cottage built by Aaron Spear. Following the 1908 death of its last resident, the cottage remained vacant until 1936 when it was purchased by Louise Coburn, niece of Maine Governor Abner Coburn (1863-64) and noted author of a two volume history, Skowhegan on the Kennebec. She restored the cottage, added a museum wing, and opened it as the Skowhegan History House Museum in 1937. It was placed on the National Register of Historic Places in 1983. No garden or landscape records date back to our early residents. Therefore, we don’t know what (or even if) ornamental, functional, or sentimental gardens were established. Most likely the in-town brick cottage with its wooden out-buildings was typical of an early Maine homestead with vegetable gardens, fruit trees, animals, and a shared well with a neighboring homestead. The original SHH garden (ca. 1970s) employed a design element commonly used during in the 1800s. This design featured an enclosed front garden with its central axis aligned with the main house entrance, thus establishing balance and symmetry in the layout of the garden. This garden showcased attractive old-fashioned plant materials (Lilacs, Peonies, Iris, and Hostas) as well as plant materials dating from the late 1800s into the late 1900s. 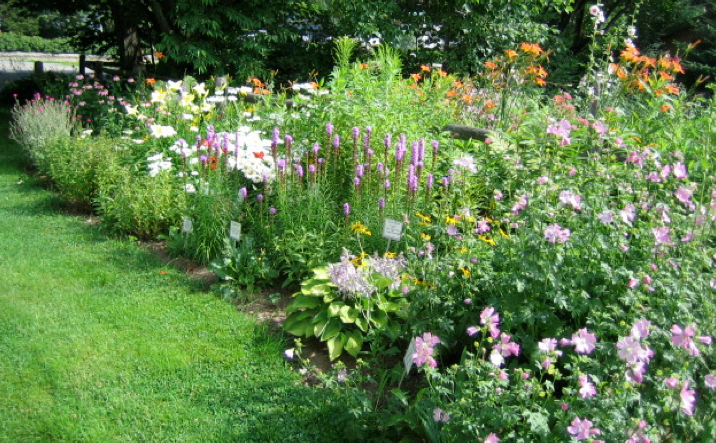 For my Master Gardener Project in 2005 I chose to transform the existing History House gardens into Heirloom Gardens. My goal was to showcase old-fashioned plant materials typical to the mid-1800s period of the History House. As I researched plant materials appropriate to this time frame, I found that many of our common old-fashioned plants originally came to North America from other continents. 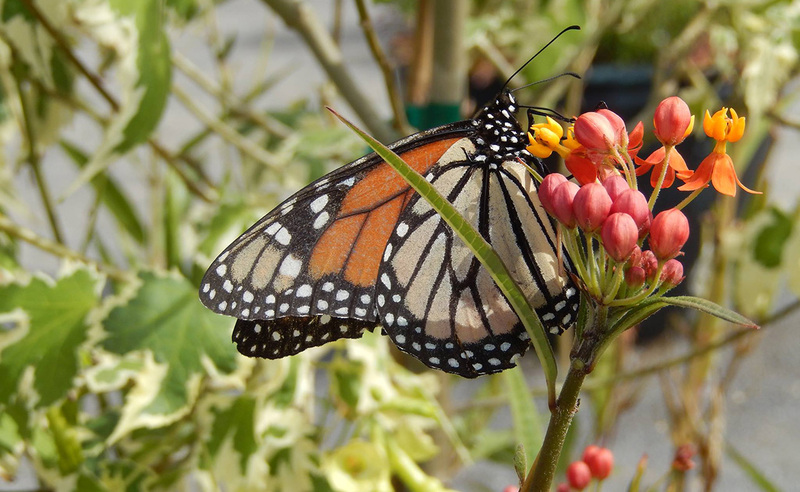 The redesigned gardens featured about 25% of native plant materials with the other 75% primarily originating from Eurasia, the Far East, and even Africa. The redesigned 2005 History House Heirloom Gardens kept the early American garden aesthetics of the front garden and added the element of a sweeping east-side Border Garden. 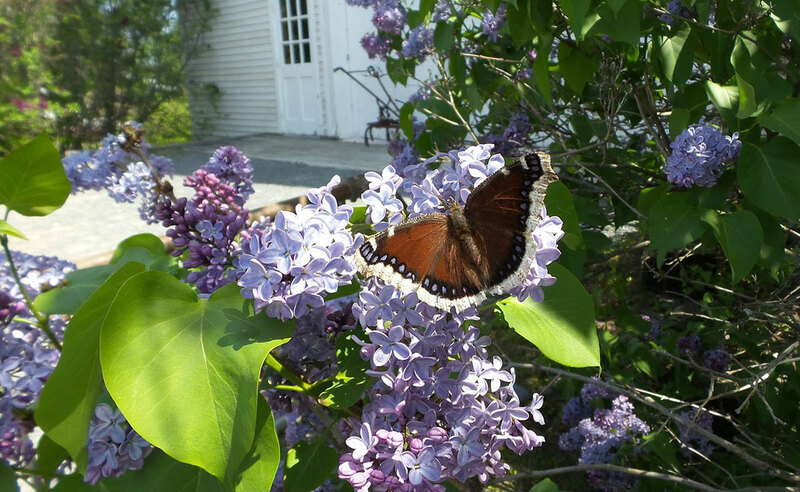 Each garden area showcases examples of old-fashioned plant materials authentic to the 18th and 19th Century time period and creates a beneficial habitat for birds, pollinators, and other beneficial organisms. An additional factor in the Heirloom Gardens design is year-round interest. Selected plant materials offer bloom times from early spring through late fall, provide pleasing foliage textures, and have striking profiles during winter months. Signage provides both botanical and common plant names for plants. The front garden was redesigned again in 2010 to accommodate hardscape changes. The crumbling brick walkway was removed and its salvaged brick was used to reconstruct a straight pathway toward Elm Street. Granite fence posts, linked by black chain, replaced the deteriorating white picket fence. New wide granite steps replaced the old unsafe step system at the front entrance and new (ADA approved) wrought iron railings were installed. Hosta plants were relocated to the front side border garden and additional heirloom plant materials were added. The Lupine was replaced with native Maine Lupine, which is blue in color. New professional signage, providing both botanical and common plant names, was installed. An Heirloom Garden Guide (located in the front garden Kiosk) now provides more information on each individual heirloom plant. The guide is organized alphabetically by a plant’s botanical name. The History House Kiosk is surrounded by False Sunflowers and pink Hibiscus. 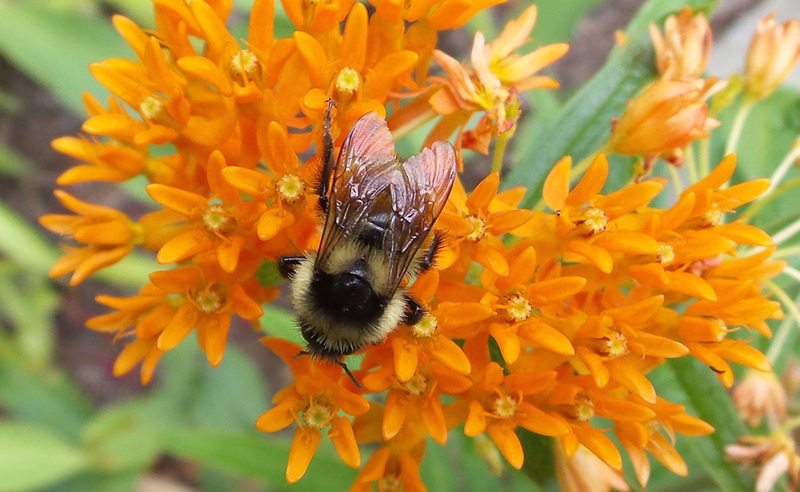 These care-free and reliable native perennials attract butterflies and bees, and are long bloomers. The False Sunflower is native from Ontario to Florida and Mississippi. The pink Hibiscus, also known as Mallow, Swamp Rose, Rose Mallow, or Wild Cotton, has an early American citation in Bartram, Philadelphia 1783. The History House Heirloom Gardens contain forty-nine heirloom perennial or biannual plants and an increasing number of heirloom annual plant materials. Our gardens feature five of the most popular old-fashioned perennials found in the 1800s garden. 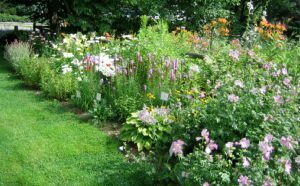 These plants are Hollyhock, Day Lilies, Peonies, Hostas, and Phlox. 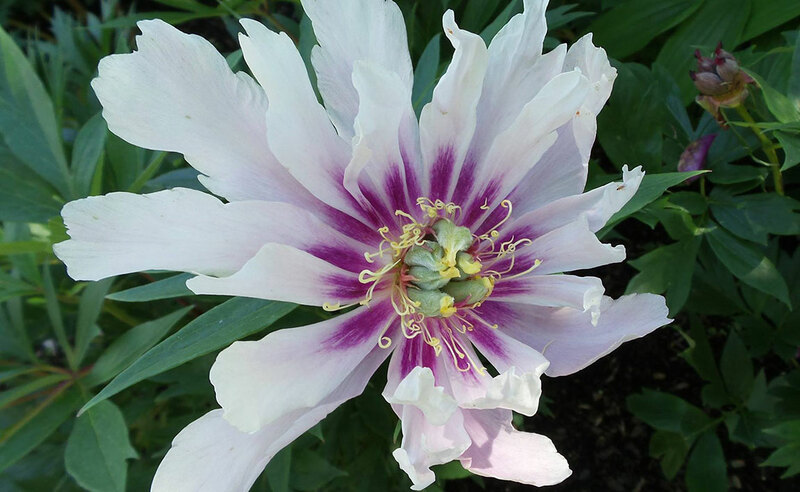 We are pleased to welcome visitors to the Skowhegan History House Museum & Research Center and its Heirloom Gardens. We are confident that you will treasure our truly unique and lovely collection of old-fashioned flowers. Introducing a new column! Since you like to garden, you’ll enjoy our new column on how to use, safely store, preserve, and enjoy your garden grown produce in easy-to-prepare recipes. This column will provide interesting facts, the latest information on food safety, food preservation, and links to additional UMaine Extension resources on food and nutrition. With the arrival of spring, some gardeners like to get sprouting early with bean and other seeds sprouted at home. Like any fresh produce that is consumed raw or lightly cooked, sprouts may contain bacteria that can cause foodborne illness. Sprouts are often served on salads, wraps, sandwiches, and Asian foods. Unlike other fresh produce, sprouts from seeds and beans need warm and humid conditions to sprout and grow. The warm and humid conditions are also ideal for the growth of bacteria, including Salmonella, Listeria, and E. coli. Rinsing sprouts first will not remove bacteria. Home-grown sprouts also present a health risk if they are eaten raw or lightly cooked. What can you do to reduce your risk of illness? Children, the elderly, pregnant women, and persons with weakened immune systems should avoid eating raw or lightly cooked sprouts of any kind (including onion, alfalfa, clover, radish, and mung bean sprouts). Cook sprouts thoroughly to reduce the risk of illness. Cooking kills the harmful bacteria. When you’re eating out, ask that raw sprouts not be added to your food. If you buy ready-made sandwich, salad, or Asian food, check to make sure raw sprouts have not been added. Contact Lois Elwell at lois.elwell@maine.edu or 1.800.287.1471 (in Maine). Published and distributed in furtherance of Cooperative Extension work, Acts of Congress of May 8 and June 30, 1914, by the University of Maine and the U.S. Department of Agriculture cooperating. Cooperative Extension and other agencies of the USDA provide equal opportunities in programs and employment. Call 800.287.0274 or TDD 800.287.8957 (in Maine), or 207.581.3188, for information on publications and program offerings from University of Maine Cooperative Extension, or visit extension.umaine.edu.